I wasn’t quite sure what to expect from Esquire. I knew little about it, apart from the fact it’s number 17 on the Top 100 list, so here we were, booked in for the 8 course degustation. On arrival we were told there are actually 15 courses all up including a number of ‘snacks’ which are all the rage right now. It’s a nice contemporary space with concrete floors, a good amount of space between tables and a view of the Storey Bridge. There was a healthy level of noise and it was quite dimly lit, so please be forgiving with my photos! I liked what came out first – Mackerel and pork hams presented on a round stone. This was followed by Salsify cooked in butter with barbecue flavours. The salsify root is similar to parsnip both in terms of look and taste. 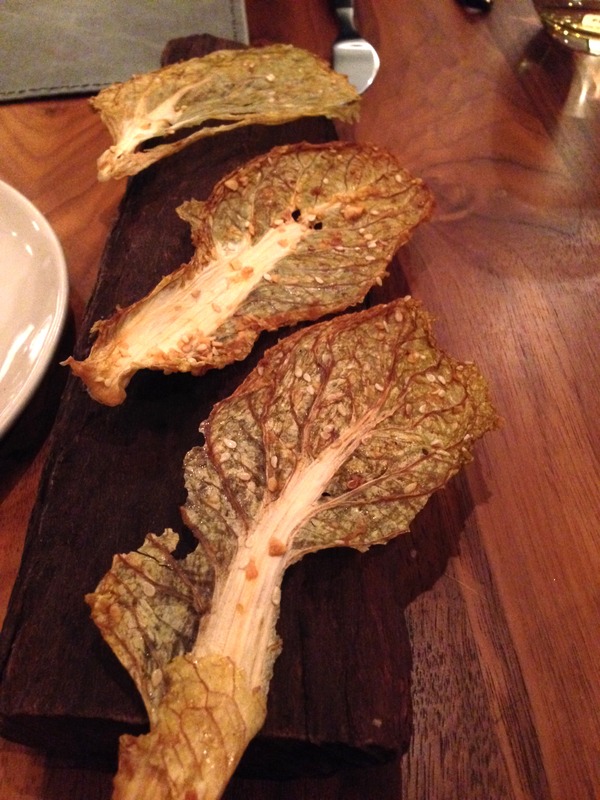 Next, one of my favourites for the night – the Air dried fermented cabbage – a taste sensation – thin leaves of dried kimchi. So much flavour and almost like eating a kimchi crisp. I could have eaten a lot more! Next came the breads – pumpernickel and crunchy malt bread sticks served with a prune paste which surprisingly lacked flavour. I enjoyed the malt bread but I’m not much of a pumpernickel fan. This was served with an iced peach and ginger tea which was a nice touch. The food kept on coming. I really liked the Fried Stradbroke Island garfish with salt and vinegar two year preserved fennel and powdered samphire. The Bitter chicory leaf with sour cream dollops and porcini powder was really interesting. The leaves were super crisp and the porcini powder was full of porcini goodness. Porcini-anything is good. Next, the Char grilled octopus, green mustard and smoked garlic. The octopus was great texture and the dish was nicely presented but the flavours didn’t really blow me away. This was followed by the Hawkesbury river fowl with bone marrow, tokay sauce and garlic flowers. It looked really pretty, and the texture was amazing – silky soft. Then the Plum and juniper strap came out – again presented on a round stone. Then, the Coal roasted calotte perilla and fresh horseradish followed by another of my favourites for the night – Wagyu beef pastrami with cucumber and tomato pickle and onion jus. A nice thick piece of meat and very tasty. Next came three ‘interesting’ dishes – cleverly done but none really floated my boat – Buckwheat split peas sprouts cheddar and its whey with native desert lime, then Pineapple strap with honey and vinegar. Finally, Blueberries, pumpkin oil roasted zante currants, native pepper and Guernsey curd. In summary, it was a really good meal – the food was very high quality with every dish made with care and precision, and there were certainly some great highlights.